NEW ! ! ! ! ! ! ! ! ! ! ! ! ! ! ! ! 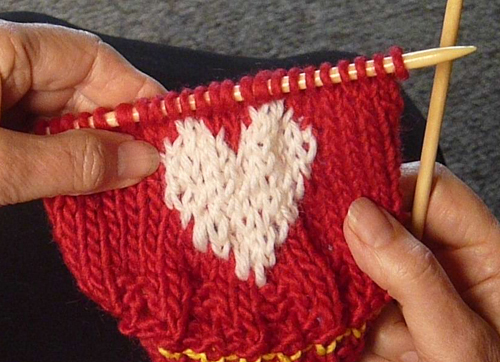 begin the HEART, watch and knit along till the HEART is completed. Knit along with Judy, step by step, as she knits these versatile legwarmers. There's an optional extra cuff for added detail. Video will show up instantly (after the transaction clears) so you can start your project right away. Get it now at the introductory low price of $4.99. 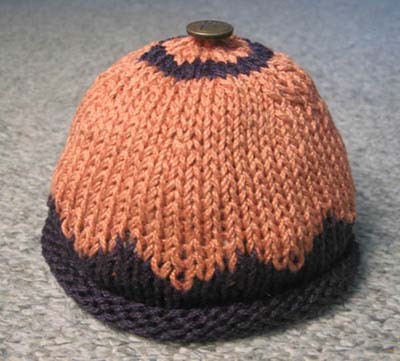 This is an up close, step by step instruction of how to knit a hat for a baby girl, including how to finish it and sew a decorative button on the top. You can play it over and over on your television, pause it, watch it in slow motion. Watch Judy's hands as she makes the hat. The cost is $9.50, free shipping. US only. Use PayPal or Google Checkout. I will try to ship within 3 days of receiving payment. HAT DVD with YARN ! You can get the DVD with up close, step by step instructions, on how to knit a hat for a baby girl AND everything you need to make the hat.......the yarn, ribbon and button. There are 2 versions. 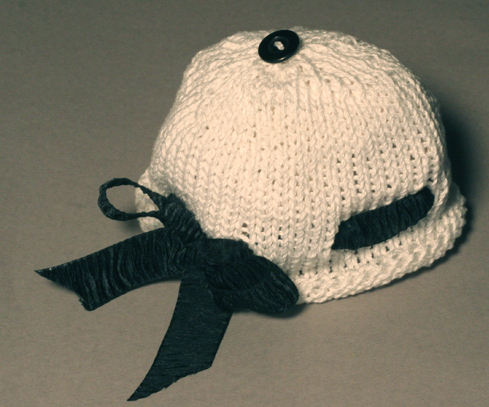 #1 comes with White Yarn and Black Ribbon (like in the photo above) and a Black and White Button. #2 comes with Black Yarn and White Ribbon and a Black and White Button. The only other thing you need is your own #8 Circular needle and a sewing needle to sew on the button.. The price of either kit is $17.00 with free shipping. US only. Use Google Checkout or Pay Pal. I will try to ship within 3 days of receiving payment. This is an up close, step by step instruction of how to knit a scarf using the LIKE LACE stitch with garter row stripes of a second color. As a bonus, the DVD also includes Judy's video on How to make FRINGE. You can play the DVD over and over on your television, pause it, watch it in slow motion as you knit along with Judy to make this scarf. The cost of the DVD is $9.50. If you want the yarn that Judy is using the cost is $18.00. Free shipping for either. US only. Use PayPal or Google Checkout. We will try to ship within 3 days of receiving payment. 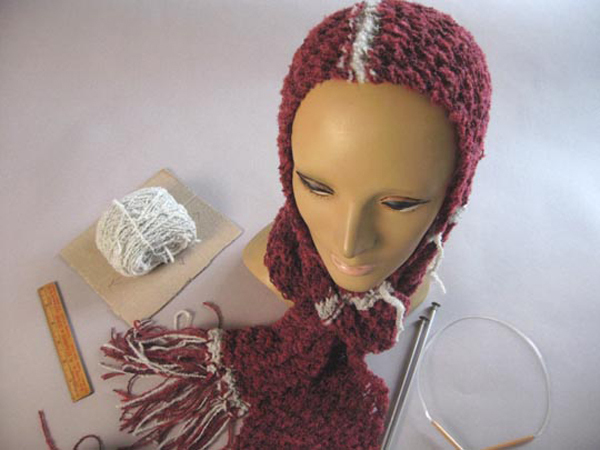 Volume 1: How to Cast on, the Knit stitch, the Purl stitch and Ribbing. and how and how to Bind off on a Purl row. The next best thing to having a teacher right next to you is having these instructional knitting DVD's by knittingtipsbyjudy . Seeing her hands doing the stitch makes it easier to comprehend and on these videos her instructions are very clear and the up close pictures make it easy to see. These DVD's are the same as the ones on the web-site, but with purchasing them you don't have to be on line to watch them, you can watch them over and over on your television or dvd player, and because you can pause, re-wind or put it in slow motion you can watch every step as she goes along and therefore learn at your own pace. We believe in simplicity. Because there is no fancy packaging we were able keep the price down to $ 9.50. If you order both the cost is $17.00. All orders include Free Shipping! Sorry, we ship only in the US. On this video Judy demonstrates 4 simple beginning fair isle stitches. The next best thing to having a teacher right next to you is having this instructional knitting DVD. Seeing her hands doing the stitch makes it easier to comprehend and on these videos her instructions are very clear and the up close pictures make it easy to see. This DVD is the same as the one on the web-site, but with purchasing it you don't have to be on line to watch , you can watch over and over on your television or dvd player, and because you can pause, re-wind or put it in slow motion you can watch every step as she goes along and therefore learn at your own pace. We believe in simplicity. Because there is no fancy packaging we are able to keep the price down to $ 9.50. Use either Google Checkout or PayPal.